Emo rockers unite!! FALL OUT BOY are on their massive “Mania,” tour in support of their seventh album – it kicked off in Chicago last fall and it’s still going in 2018 and not set to stop any time soon!! With special support from Machine Gun Kelly, they’ll hit the Mohegan Sun Arena on Friday 31st August 2018! 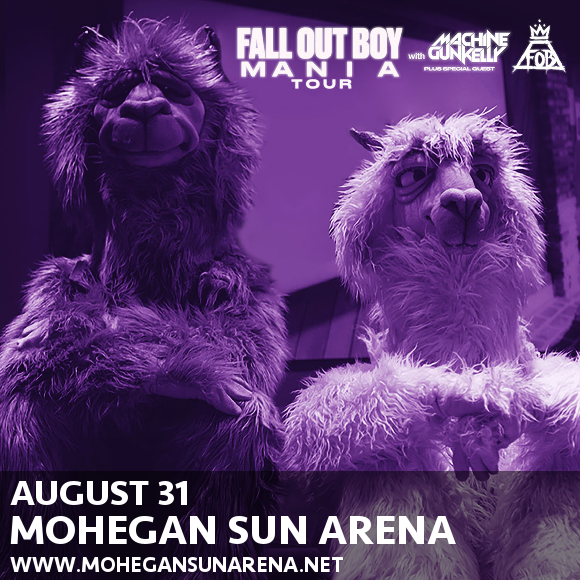 Jump the queue and book your Fall Out Boy and Machine Gun Kelly at Mohegan Sun Arena tickets while you still can! Tickets on sale NOW!! Released last year, “Mania,” marks the 7th full-length studio release by the world’s favorite emo band, the successor to 2015’s “American Beauty/American Psycho”. Once the band had written the song "Young and Menace,” the fresh, electronic-infused sound for the “Mania,” album was set and the band began work on one of their newest albums in earnest, keeping fans hanging on the edge of their seats as the release date was pushed back to make sure the album was the very best record they could make. We can hardly wait to experience Fall Out Boy’s electrifying new sounds live – get your tickets NOW while they last! !